Day two at APEX certainly awoke some intense feelings from experienced IPC members. I woke up early – just like my colleague Jarl – 4:30! But, as the good sleeper I am, I managed to relax and sleep some more before I started preparing the day. 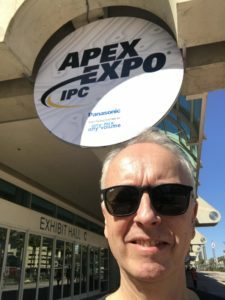 Most important thing first, registration at IPC APEX Expo 18. 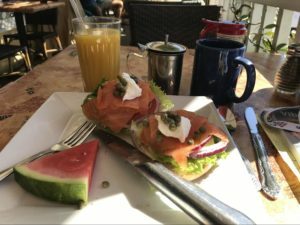 Then a healthy breakfast at the marina and a talk with my wife – very important! In the early afternoon, I joined the first meeting, the Electronic Documentation Committee. Key people in the committee showed up and we had great discussions. CircuitData was of course on top of my mind, and my impression is that CircutData is finally being accepted. Especially the material database caused raised eyebrows. Representatives from Cisco expressed interest for both CD and the material database, and Chris Shaw invited to discuss how IPC-2581 can have a direct reference to CircuitData and the database. CircuitData is certainly on the road, and this was a great intro before the presentation Monday morning. Micro PCB – new term coming up? Committee Chair Council was up next – all task group chairs and vice chairs meet to share and receive updated information from IPC. As the only one outside IPC management, I had a presentation on the new term «Micro PCB». 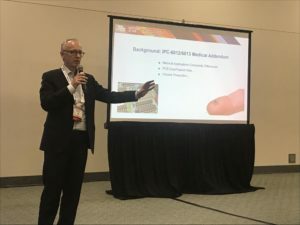 A term we at Elmatica request to be a new one in the IPC universe, with reference to PCBs at a miniaturization level that makes them unfit for the existing standards. The audience was caught a bit off guard, but David Bergman forced through a written proposal to be submitted for technical evaluation. For me this was a success – the proposal was not directly rejected. Although one of the grand old ladies of IPC clearly announced she wanted to kill the proposal directly :) Still, many people gave me support and I guess the final approval and implementation will be in IPC Fall Meetings in October. Who would think PCB, IPC and Ice Cream are great matches? Nice surprise to spot this sign. 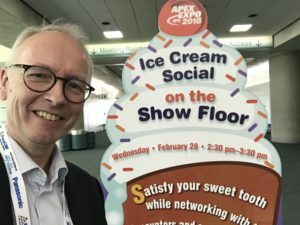 I hope I have time to join the Ice Cream Social on the Show Floor – I love Ice Cream!! A great first day at the fair! 2018 – year of the dog – we are ready for you! CircuitData on the map, Happy Holden and Andy Shaughnessy!